I had a little trouble finding all of my ingredients, and I had to order the rennet online. Rennet comes in tablets, and some sources say you can use those and others say you cannot (they are apparently NOT the same thing). I opted to use the liquid animal rennet. If you choose to go another route, either realize your results may differ, or do a little reading first. There are many recipes out there, so you can find one and try it. As always, I’d love to hear about your results. Be sure to start out with clean tools and hands. I even chased my dog, Pauli out of the kitchen. 1 cup whole milk –I got organic non homogenized but I don’t think this is critical. 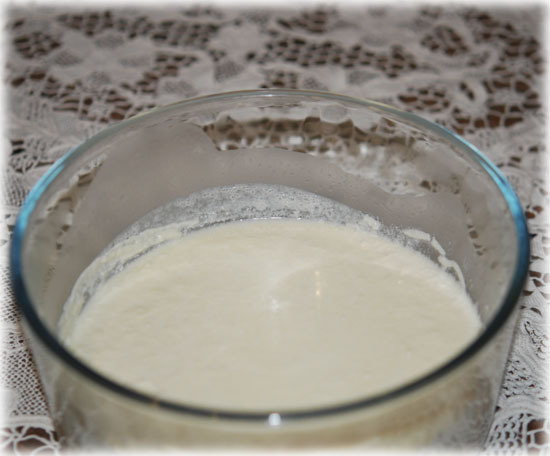 Pour your milk and cream together into a glass bowl. 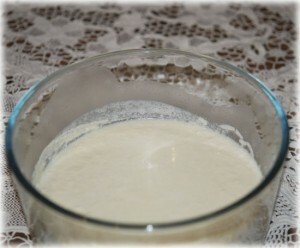 Mix 1/8 pkg of your kefir starter into the mixture and mix together well. Add 2 drops of the rennet and whisk together until well combined. Place in a glass bowl with a lid and put into a warm place over night (about 8 hours). I put mine into my microwave (NOT TURNED ON!) I don’t think it’s critical. Just set it out of the way and out of drafts. In the morning (or after about 8 hours) you should find it should be ready for the next step. It will look like its got a solid sort of mass on the top and liquidy on the bottom, sort of like yogurt, but a little thicker. 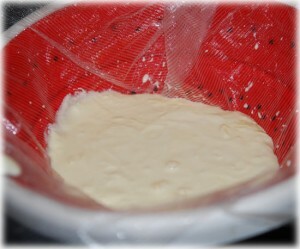 Take a strainer or colander and put cheese cloth into it. Pour it into the colander and let it drain so the liquid will drain out for several hours. You can cover it to keep anything from contaminating your cream cheese while it drains. A note here about cheese cloth. I also had trouble finding it, and ended up ordering it when I ordered the rennet. I think you can probably use another type of cloth, as long as it has a loose enough weave to let the liquid drain through but is tight enough not to let the cream cheese come through. One website suggested an old pillow case. Obviously if you use something like that you will want to wash it first. I actually liked the disposable cheesecloth I ordered. It comes in a big sheet so you can cut whatever size you want and toss it when you’re done. I also used it when I made butter (oops, I just gave away my next blog subject!) and I’m sure I will find other uses for it. OK, back to the project at hand. Once it has drained, put it into a glass bowl and it’s time to add your flavorings. I decided to go with something sweet. 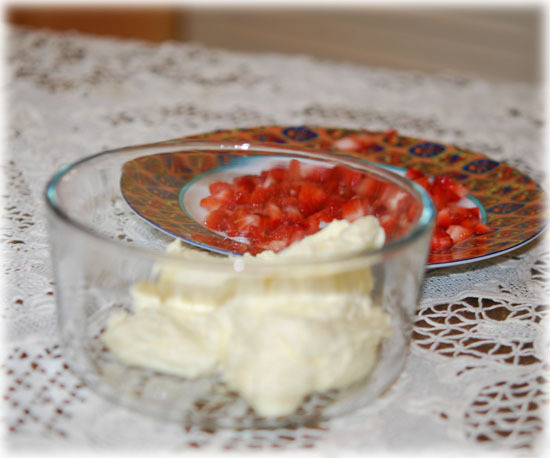 Right now strawberries have been wonderful, so I finely chopped a handful and mixed them in. I didn’t sweeten it, although if you wanted it sweeter I think a little honey would be great. If you wanted a more savory flavoring, try an herbal combo that suits you. I see a lot of different flavors of cream cheese in the stores, so I think the sky is the limit! Just get creative. One thing I did notice was that the next day, in the fridge, it was a little more firm than regular cream cheese gets. However, it softened up quickly when I scooped it out and left it out for a few minutes. Just keep that in mind. 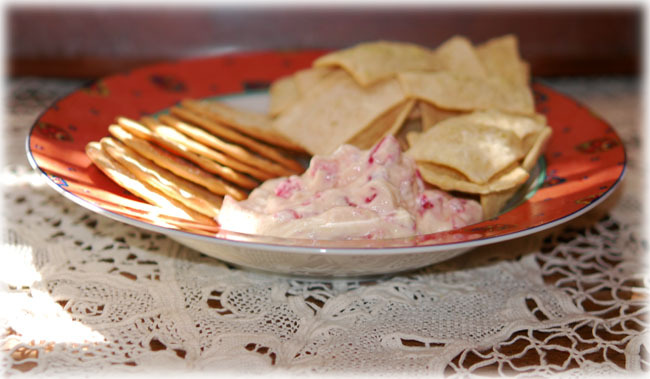 I served it with crackers for my husband and wheat free crackers for myself. Awesome! 🙂 And the next morning I had a little scoop of it with my gluten free pancakes. 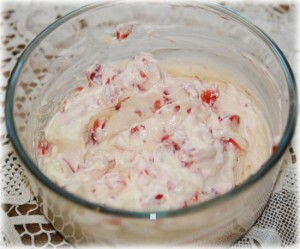 It was even better the next day, as it absorbed a little more of the strawberry flavor. Yes! This is definitely something to keep in my arsenal! It does look fab. I’m another one who can’t eat cheese, although I can tolerate some goat’s cheeses (feta is delicious). 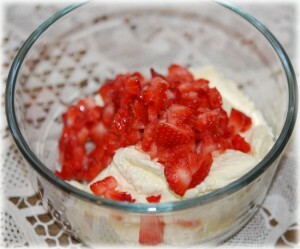 I love that you’ve put strawberries with it. Must remember the diet… must remember the diet. In all fairness hats off to you. I will try anything once but I’m not sure I would dare trying to make my own cheese. That looks really tasty, I love cheese and do eat it. I cut out all dairy products for a while when I was first diagnosed with fibro as I read that can help but it made no difference. If i can get hold of some non animal rennet I might give it a go. Do you know if there is a vegetarian alternative to rennet as my daughter is a vegitarian but will eat vegitarian cheese made without animal rennet. I will have to google it I think, I will let you know if I find something that works. Yes, the place I bought my animal rennet also has some made from vegetable sources as well, I believe. 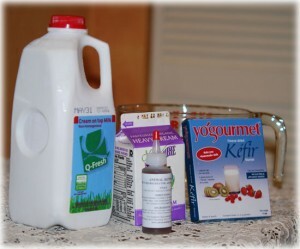 Another great, interesting post but i now need to find out what kefir starter is as i havent heard of that before. Sounds lovely with strawberries in. 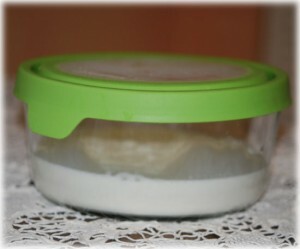 You can use other sorts of starters, I saw something called mesophilic starter. You can look at any cheese making supply places online. The kefir starter was easy to find, so I used that. I sometimes buy premade kefir to drink also, it’s sort of a fermented milk product, a little like yogurt. My mum used to make cheese, I remember the cheese cloth she used came on a roll. I hated it then but love it now, especially with fruit. I’m not a big strawberry lover but I like any cheese with kiwi fruit. Oh, kiwi sounds good too! My husband and I were at the store trying to decide what fruit to use. I am not fond of fresh raspberries or blackberries, and blueberries can be either really great or not good at all. The strawberries have been really good lately, so we went with them. I thought long and hard about the peaches, but to be honest, usually store bought peaches are a little tasteless. I might try kiwi though, thank you for the idea.